PSX Tenchu: Stealth Assassins (JPN v1.0) in 16:34.17 by N?K. It is 16th century Japan and you are one of two ninja employed by Lord Gohda, an uniquely compassionate samurai lord. As either Rikimaru or Ayame, you must proceed through your assigned quests, at first dispatching the amoral and unsavory folk in your lord's domain. As the game progresses, you will come face to face with greater threats from tengu goblins and oni demons. A full 3D game in the Tomb Raider spirit, Tenchu focuses on stealth and attacking unseen over straight action. Not being spotted leads to higher scores and better equipment. To aid in this, you can not only creep about and hug walls, but also use your grappling hook. 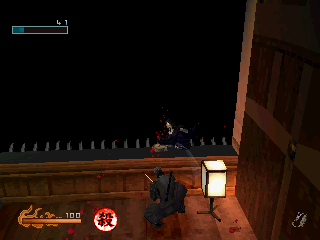 This run by N?K was done on the Japanese version of the game, Rittai Ninja Katsugeki - Tenchu. Because of significant differences between this version and the USA version, this run was judged not to obsolete the other run of this game.